Using any foodstuff on stage can be hazardous in ways which are not immediately obvious. The mess created by food is one problem. A wipeable stage surface should be used – old dance floor is ideal, with the seams firmly taped. Using food on a wooden stage can cause problems of staining or food particles getting stuck in wooden boards. Some organic foodstuffs must never be used on stage. This includes flour, cornstarch, custard powder and sugar, which are all highly flammable when in dust/cloud form. Throwing flour around on stage, near hot light fittings, could lead to a disaster. Fullers Earth (a clay-based absorbent natural product) is a safer alternative for any dust effects. Their bread ranges are particularly good. *Important: If you’re making fake white wine for stage use, don’t use grape juice if the ‘wine’ is sitting in a bottle undrunk for a few days. The juice will start to ferment and the bottles may explode! For ‘wine’ that actors don’t have to drink, use a squash / cordial. Always make juice dilutions fresh each day. A few drops of food colouring should be mixed into a glass of sparkling water to make the colouring solution. Put three sugar-cubes into the bottle, and push the cork in as fast as possible. Reapply the wire and foil from the original champagne bottle (or use aluminium foil that’s been spray painted gold). Glass should not be used on stage where an alternative is available. 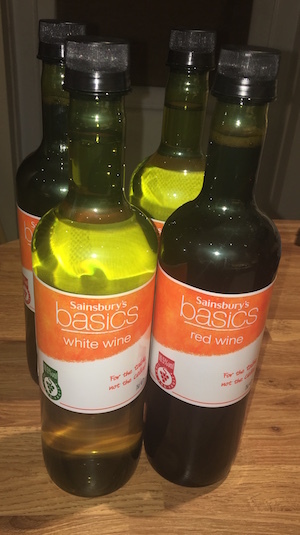 Sainsburys and other UK supermarkets sell some wine ranges in plastic bottles with screw tops. A non-alcoholic canned drink can be wrapped with a printed label of an alcoholic brand (or even one you’ve designed yourself to avoid product placement / copyright concerns). Lono.co.uk offer a wide range of alcohol-free canned and bottled drinks.